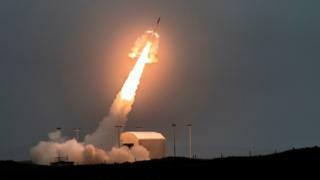 Nine contractors at the UK's largest missile range have been made redundant. The cuts were made at the Hebrides Rocket Range after accommodation at its West Camp in Balivanich on Benbecula was scaled back. Catering contract company, Elior UK, has confirmed that it had reduced its staff. The Western Isles range, which employs about 200 staff in total, is operated on behalf of the Ministry of Defence (MoD) by the contractor QinetiQ. Elior UK said: "We can confirm that nine Elior employees have been made redundant following consultations to determine the level of catering required for the scaled-back facilities at the West Camp." Work was recently completed on a refurbishment and downsizing of accommodation at West Camp. A spokesman for QinetiQ said the West Camp remained "open and operational". He added: "We can confirm that our catering contractor, Elior, has now concluded its work to determine the resourcing requirement for its management of the scaled-back facilities." The Hebrides Rocket Range, set up in the 1950s, has sites on Benbecula, North and South Uist and a radar station on the remote St Kilda archipelago. The range offers the largest area in the UK for the live-firing of rockets and missiles. In 2009, there were concerns expressed by the local council, Comhairle nan Eilean Siar, and by island politicians that the range would be shut down. The MoD gave assurances that the future of the site was safe and last year announced plans to invest in the range. Na h-Eileanan an Iar SNP MP, Angus MacNeil, said the range was the largest employer in Uist and any job losses would have "a huge impact on the economy".